A dummy node is a zero-sized node that has no visual representation. It is used to organize the other nodes into a hierarchy. Usually the dummy node serves as a parent node for a group of nodes of the same type. 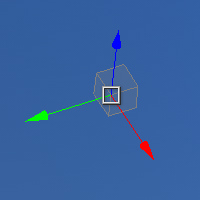 The dummy node, though invisible, has the same common options as other nodes: it can be transformed (moved, rotated or scaled) and have a property assigned. The dummy node differs from the dummy object: you cannot assign physical properties to the dummy node. To create a dummy node via UnigineEditor, click Create -> Node -> Dummy on the Menu bar and then place the dummy node somewhere in the world. The dummy node is created automatically when grouping the selected nodes. See how to Organize Nodes via the UNIGINE Editor 2.